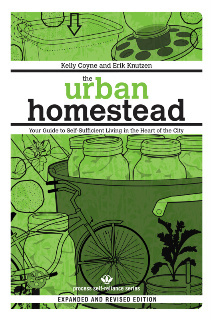 Process occupies center stage in a current controversy regarding our title, “Urban Homestead” by Kelly Coyne and Erik Knutzen, which is currently available in a Revised and Enlarged Edition! We have been served legal notice from the so-called “Dervaes Institute,” a backyard farmer in the Pasadena area, that they have now trademarked “Urban Homestead” and “Urban Homesteading” and a number of other related phrases. And that in the future, we must attach any communication about those phrases with a Â® mark, and link it all back to their own website. We were surprised that they think they own a phrase in common use for decades and about a book that was published prior to the time that a trademark was even applied for. The “Dervaes Institute” also served notice to other urban homesteaders and at the same time had Facebook take down mentions about our book or even farmers market forums that spoke about urban homesteading. These odd and legally shaky demands enraged thousands of people. We also got backing from the extraordinary civil rights legal firm, EFF! Check their posting here. You can view some of it on a facebook page titled “Take Back Urban Home-steading(s),” which acquired nearly 6,000 friends within days. “Ask A Mexican” Gustavo Arellano also wrote an article on the situation here. Can some kook grab rights to a term used by people for over a hundred years? We’ll soon find out.